BLOOMINGTON — Bernard W. Sheehan died June 13, 2015, at Hospice House in Bloomington, Indiana. He was born February 24, 1934, in New York City. He graduated from Fordham University (1957); received an A.M. from the University of Michigan (1958); and completed a Ph.D. at the University of Virginia (1965). He taught at Regis College, the University of Virginia, Madison College, the University of Alabama and the College of William and Mary before joining the Indiana University history department in 1969. During his tenure, Bernard established himself as a specialist in American Colonial, Revolutionary, Intellectual and Indian History. 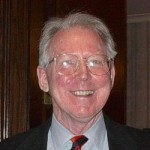 Following his retirement in 1998, Bernard served as editor of the Indiana Magazine of History. He was an active member of The Heritage Foundation, The Philadelphia Society and the Acton Institute. Bernard married Janina Urich in 1957. They raised three children and he was a constant and devoted husband and loving father. He was humble, dry-witted, patient, generous and kind — loved good conversation, classical music and opera, oriental carpets, antique delft, old movies and beer. He loved to sit and read all day with our cat. Bernard lived a life of the mind, pursued truth, loved beauty. He held a deep faith, but was neither pious nor sentimental. Beloved by family, friends and students and an example to all. He is preceded in death by his parents, Margaret (Chidwick) and William J. Sheehan; aunt, Helen Chidwick; sister-in-law, Marjory Gamache Sheehan; brother-in-law, Joseph Urich and numerous relatives that an Irish Catholic family so often provides. He is survived by his wife, Janina U. Sheehan; his children, Neil J. Sheehan (Pauline) of Evanston, Illinois; Manya Sheehan Basile of Beverly Hills, Michigan; Jessica Haines (Andrew) of Phoenix, Arizona; grandchildren, Drew and Charles Basile and Ian and Aidan Haines; brother, John C. Sheehan of Maryland; and brother & sisters-in-law, Kenneth and Virginia Driver and Margaret S. Urich, also many cousins, nieces and nephews. If desired, donations can be made to Hospice House, IU Bloomington Hospital Foundation, P.O. Box 1149, Bloomington, Indiana 47402 or St. Charles School, 2324 E. 3rd Street, Bloomington, Indiana 47401. A Memorial Mass will be celebrated at St. Charles Borromeo Catholic Church in Bloomington on Thursday, June 25, at 11 a.m. Family will receive visitors prior to the Mass at the Church from 10 to 11 a.m.
Our gratitude to Drs. J. Jesseph, D. Joyce, T. Sharp and the exceptional staff of Hospice House for their compassionate care. 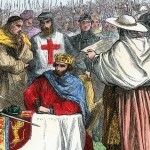 On June 15, 1215, at Runnymede, in England, King John signed Magna Carta. The rest, as they say, is history. On June 15, 2015, at Wheaton, in Illinois, King John, under the watchful eyes of wary barons, bishops, and knights (or at least professional actors bearing a more than cinematic resemblance to them) will do it again! Please join us for the occasion. The Lincoln Legal Foundation, the British Consulate General at Chicago, the Chicago Lawyers Chapter of the Federalist Society, and the Du Page County Bar Association are banding together to force King John once again to the table, and to celebrate Magna Carta on this signal anniversary. The actors and reenactors will be drawn from the ranks of the Fury Theatre Company and the Barony of Ayreton of the Society for Creative Anachronism. The reenactment and festivities will take place, appropriately enough, on Monday, June 15, 2015, at 5:00 p.m. on the lawn of the Du Page County Government Complex [sic – calling a campus containing a courthouse, a jail, and sundry administrative edifices a “complex” is truth-in-advertising, to the lasting credit of the yeomen citizenry of Du Page County], 421 North County Farm Road, in Wheaton, Illinois. The program is open to the public without ticket and without charge. We solemnly pledge this much: Consistent with Article 29 of Magna Carta, no Freeman shall be taken or imprisoned, or be disseised of his Freehold, or Liberties, or free Customs, or be outlawed, or exiled, or any other wise destroyed by Virtue of Attending this Event. Donald Devine, How to Fight the Bureaucratic State: If Congress can’t, citizens may need disobedience. John Zmirak, Is Pope Francis an Oracle? 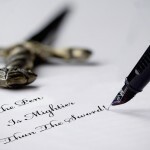 John Zmirak, Jeb Bush at Liberty U: Election by Faith Alone? George Leef, Is It Possible To Undo The Court’s Term Limits Blunder? Daniel Oliver, Tell A Joke. Save A Culture. John Zmirack, Should Christians Execute Terrorists? Donald Devine, Election Roadmap to GOP Defeat?